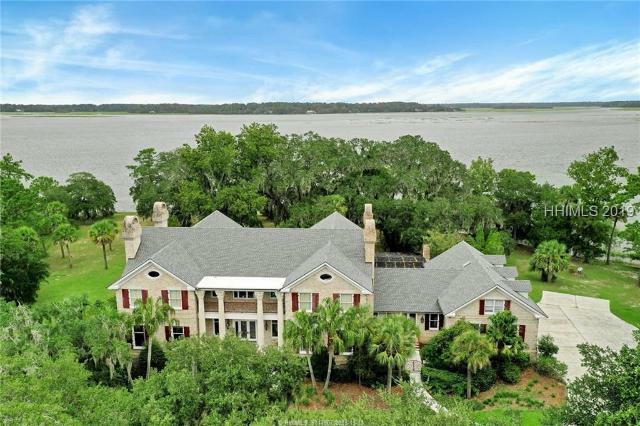 Fabulous Village Home Overlooking the Inland Waterway! Don't miss this opportunity to own a completely updated and renovated home located in the heart of Palmetto Bluff. Situated on a corner lot, the home is flooded with light and surrounded by beautiful views. Featuring 3 bedrooms, 3.5 baths and a loft area (with a Murphy bed) the home is perfect for a primary or vacation property. The gourmet kitchen centers around a large island with pendant lighting and Viking appliances. Relax and enjoy all the activity of the Village on the generous screened porch or from the swing bed on the front porch. The property has an excellent rental history. Centrally located in the West Wilson area of Palmetto Bluff! A white picket fence and generous front porch welcomes you into the 3 bedroom main home. The open floor plan with ship lap walls and cathedral ceilings features a first floor master bedroom, second floor den, office, mud room, gourmet kitchen and more. French doors in the great room and master bedroom open onto an expansive screened porch that overlooks a beautifully landscaped backyard. The guest house above the garage is perfect for extended family or guests. The home is just steps to the Lawn and Racquet Club, parks, shopping, restaurants, boating, golf and more. This brand new, architecturally stunning home with lake view was strategically positioned to enjoy ALL amenities of Palmetto Bluff's Wilson Village. Walk/bike to the Canoe Club Pool & Fitness Center, enjoy a meal at local's favorite trendy Buffalo's or relax at the Spa at Montage. All a short walk - no need for a car! This 4 bdrm, 4.5 bath home w/an eye catching low-country exterior is coupled with unparalleled craftsmanship inside. Highlights include soaring 23' great room ceiling, black walnut floors, custom fireplace, designer kitchen, luxurious baths & more! The 2-car garage features a carriage house above. Truly a must-see home! Palmetto Bluff 2016 Lighthouse Award Winner Best OVERALL,Best KITCHEN,Best EXTERIOR. 3 BR, 3.5BA nestled on cul-de-sac. Views from 2 porches to May River and rear views to lagoon/preserve. Custom lighting,SOLID quality crafted wood doors and unique design features throughout. Kitchen features 6 Burner WOLF Gas Range, LEATHERED Granite counters,Farm sink,huge center island,custom cabinets opening to large Dining/Great Room w/2 Story Tabby Fireplace.Main floor Master,over-sized guest rooms w/en-suite baths,barn doors and loft sitting area.1600 sq. ft of Decks/patios,4 car garage w/elevator foyer. Highly energy efficient, foam,2 tankless W.H.